Any good electronics designer knows that a short in the line interrupts the flow of current. Even having more resistance than intended can cause serious problems. The same principals hold true in the distribution of the parts and components that electronic designers depend on. Mouser Electronics is one of the nation’s largest distributors of semiconductors, interconnects, sensors, cables and other electronic components. 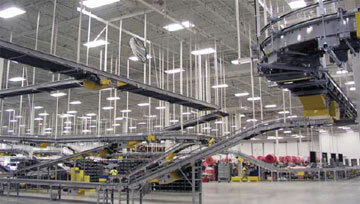 Its distribution center in Mansfield, Texas, picks and packs thousands of parts daily. The company prides itself on same day shipping - orders received by 8:00 PM ship the same day. Mouser is one of the few electronics distributors willing to pick and pack small parts orders, which gives it an advantage that has catapulted the company to a leadership position in the electronics industry. Additionally, the growth of the Internet has brought new customers from all over the world, contributing to the company’s tremendous growth rate. “We have been averaging a 33% annual growth rate since 2002,” explains Pete Shopp, director of operations for Mouser. With such accelerated growth, Shopp says it was inevitable that the Mansfield facility, built in 2001, undergo an upgrade. The driving concern centered around capacity constraints and the need to alleviate bottle necks caused by increasing volumes in Mouser’s consolidation, packing and shipping areas. Previously, Cisco-Eagle designed an addition that more than doubled the facility size from 105,000 square feet to its current 280,000 square feet. New Hytrol conveyors were the centerpiece of the material handling in the new addition, bringing products from pick zones and carrying them through newly built consolidation, packaging and shipping areas. The changeover, directed by Cisco-Eagle, was also completed in an amazingly short span of time. First, the conveyor sections were pre-built in the new addition. Then the shipping area was dismantled on a Friday night. The systems were connected over the weekend and everything was ready to go by Monday. “We did not have any down time at all,” recalls Shopp. Most of the 160,000 SKUs at Mouser Electronics are housed in carousels, though some slower-moving parts are stored on shelving. To fill orders, the warehouse management system directs the carousels to spin to locations where required products are stored. Workers then batch-select a quantity needed for several orders and count out the exact amount for each customer. While parts for a specific customer are being picked out of one carousel, the warehouse management system is timing other picks for the same customer from other carousels. “If we are picking for a line order that has five different SKUs, those parts may be picked at the same time from five different areas,” explains Shopp. It is the job of the consolidation area to bring all of the parts for a customer together. Once a worker selects parts from a carousel, he places the items into plastic bags labeled with specific information about the customer. The bags then are deposited onto a takeaway belt conveyor. The conveyor selected for this role, a Hytrol TR slider bed, had to be able to transport a range of parts of differing sizes. The bags must ride safely on the conveying surface without damaging the sensitive parts inside or falling through, such as might occur with roller conveyors. The TR slider bed conveyor, with its troughing bed and guard rails, is well suited for the task. From the carousels, the belt conveyor carries the bags of picked parts to an operator, who performs a quick visual scan before sliding the bags on to other belts or chutes that feed seven consolidation stations. Once in consolidation, a worker scans the bar code on each bag. He is then instructed to place the bag into a customer-specific tote. Parts for that customer that were picked from other carousels also find their way to the consolidation station and are placed into the same tote. Once all items have been gathered, the worker pushes the tote off onto one of four Hytrol ABEZ zero pressure accumulation conveyors. Each of these takeaway conveyors serves two consolidation stations. The four lines next merge to two lines using parallel belt declines that singulate the totes. The first of the two lines, which also carries larger parts and components picked as complete boxes, are conveyed to a single shipping lane on a Hytrol ABEZ zero pressure conveyor. The other line of totes is transported on a Hytrol SB conveyor with a slick top belt. Totes in this line pass through a PROSORT 45 with pivoting bow arms that swing out over the conveyor to direct the totes to 48 pack stations. Control systems assure that work is properly balanced among the pack stations, while Hytrol EZ Logic accumulation conveyors also provide plenty of space to gather product during peak times. In the pack stations, workers place the parts into cartons, add air-filled cushioning material and packing lists. Each carton is then sealed and a shipping label is affixed before it is slid onto another conveyor line for transport to shipping. The four shipping lanes feature double stacked ABEZ zero pressure accumulation conveyors that provide needed accumulation while minimizing the gaps between varied sizes of cartons. Products are then manually sorted for UPS and FedEx deliveries. Altogether, Mouser processes about 4,000 orders and 14,000 lines daily. During the fourth quarter of last year (after the expansion was completed) the company shipped a remarkable 99.9 percent of orders same day. The designs from Cisco-Eagle also permit future expansion of the systems within the new addition to accommodate even more growth. For example, the 48 pack stations can become 96 stations. The current design allows for the facility to handle up to 6,000 orders and 20,000 lines daily. Soon Mouser will also be retrofitting the facility’s receiving area. Within the facility, receiving tasks will be shifted to an area that is closer to the new addition, which will allow faster putaway to storage in the new building and will help process a higher level of SKUs. Shopp says he expects to reach 200,000 total SKUs sometime later this year. Because of how dependable the Hytrol conveyor products have been, Mouser will re-use some of the old TA slider bed conveyor removed from shipping during last year’s renovations. Such flexibility is one reason why Mouser chose Cisco-Eagle and Hytrol conveyors in the first place. Shopp says that aesthetics also matter. 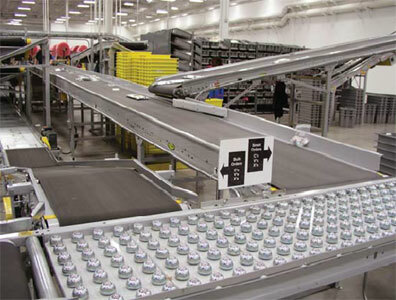 The Hytrol conveyors provide a classy, uniform appearance in the building.